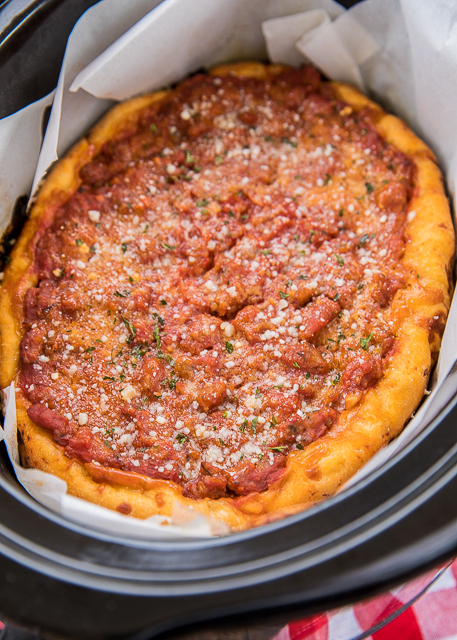 I am SO excited about this Slow Cooker Deep Dish Pizza. This was the first time that I've made pizza in the slow cooker, but it certainly won't be the last!! It was super easy and it tasted DELICIOUS!! 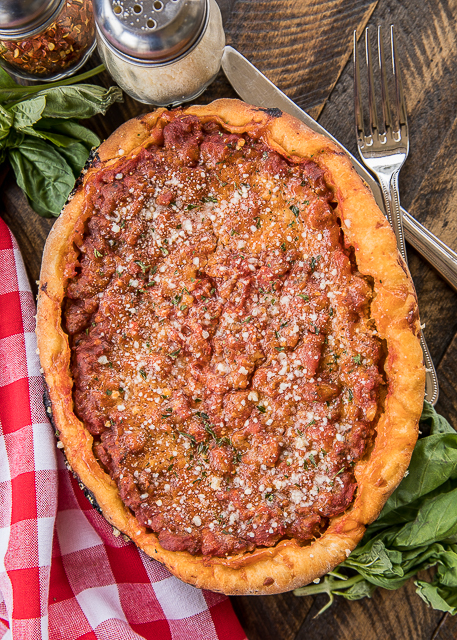 This recipe is kind of a take on Chicago Style deep dish. It isn't a totally authentic recipe, but it is still a really good pizza recipe. 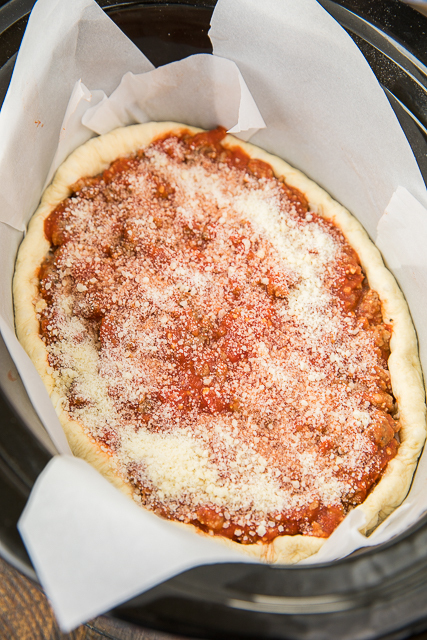 The crust for this Slow Cooker Deep Dish Pizza is fresh pizza dough from the grocery store. They sell it in the deli/bakery section at my grocery store. If you can't find the fresh pizza dough, you can use thawed frozen pizza dough or make your own. It will all work great!! You can make the sauce ahead of time or even assemble the pizza in the slow cooker the night before and cook it when you are ready. It would be great for parties or an easy weeknight meal! Get creative with your toppings. 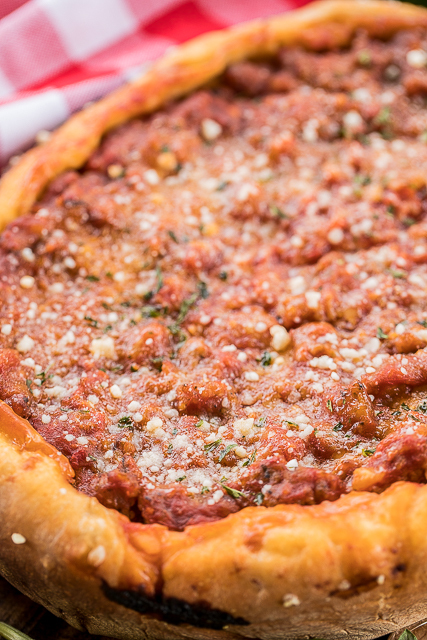 I am a sausage and pepperoni girl, but just add your family's favorite toppings. Bell peppers, mushrooms, onions, olives - anything goes! Brown sausage in a skillet over medium-high heat until no longer pink. Drain fat. Add garlic to the skillet and cook for 1 minute. Add tomato puree and onion flakes to skillet. Stir and cook for 1 minute. Remove from heat. Roll dough on parchment paper, two inches longer and two inches wider than the insert of 6-qt. slow cooker. Place parchment and dough into the slow cooker, restretching dough as necessary to come up sides. Sprinkle mozzarella cheese on top of crust. Sprinkle pizza toppings on top of cheese. 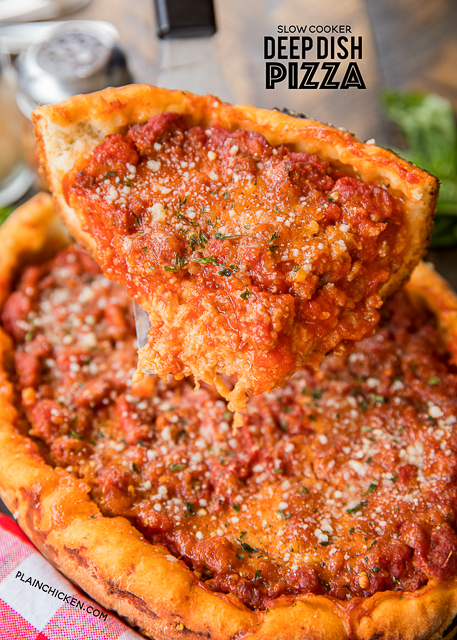 Spread meat sauce on top of pizza toppings. Cover top of slow cooker with paper towels. Cover the paper towels with the lid - stretching paper towels tight. Cook pizza on HIGH for 3 hours, or LOW for 6 hours. Transfer pizza to a cutting board by lifting it out with the parchment paper. Top pizza with Parmesan; let cool 2–3 minutes before slicing. The paper towels prevent moisture from dripping onto the pizza's surface as it cooks. It was just a ball of pizza dough from Publix grocery store. No brand. Lay some paper towels on top of the slow cooker after the pizza is assembled and put the lid on top of those paper towels and lock it down. I don't think pictures of that are really necessary.